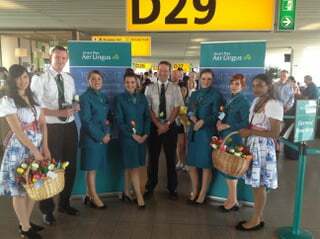 Aer Lingus is marking 70 years of flying from Ireland to Amsterdam, the first ever flight having departed from Dublin on 7th July 1947. While today Aer Lingus, Ireland’s only 4-star airline, flies from Dublin and Cork to Amsterdam on a modern Airbus A320 with 174 seats onboard, in 1947 the first flight from Dublin took place on a Douglas DC-3 aircraft with just 25 seats. The Dublin-Amsterdam service started with just two flights per week and operated via Manchester before heading for Amsterdam. It was in summer 1974 when Aer Lingus’s first non-stop service began from Dublin to Amsterdam and less than 10 years later flights took off from Cork in 1983. Passengers were presented with a tulip to mark the occasion. Today Aer Lingus operates four flights per day from Dublin and up to two daily services from Cork to Amsterdam, which is one of the most popular European city break choices for Irish travellers, as well as being a key business destination. The Aer Lingus flight crew that operated the DUB/AMS/DUB flights today. In addition to connecting Ireland to Amsterdam and vice versa, many Amsterdam travellers are choosing to fly to North America via Dublin and Aer Lingus offers connections to 11 key destinations such as New York JFK, Boston, Newark, Hartford, Orlando, Chicago, San Francisco, Los Angles, Washington, and Toronto, as well as Miami, which is a new service beginning on 1st September 2017. With Dublin Airport ranking fifth in the league table of European transatlantic airport for connectivity into North America and the only European airport to offer US pre-clearance, it is an attractive offering for travellers not just in Ireland but in Europe and beyond. At Dublin Airport Aer Lingus guests can pre-clear US immigration before stepping onboard their transatlantic flight, which means that when arriving into the USA they are seen as domestic passengers and avoid any lengthy queues stateside.